I can finally write about my past year, the days and long nights where the heart faces reality. After losing our eldest son John Robert to a car accident on August 4, 2014, I could not talk or see anyone. I was still in shock until recently. But healing has begun and I feel good about life again. So I had to do this for my own healing. I had never really done any embroidery, but took a class with Carol Woolford and learned some basic stitches. I only used chain, satin, and blanket stitches, but you can vary them so much to create textures. 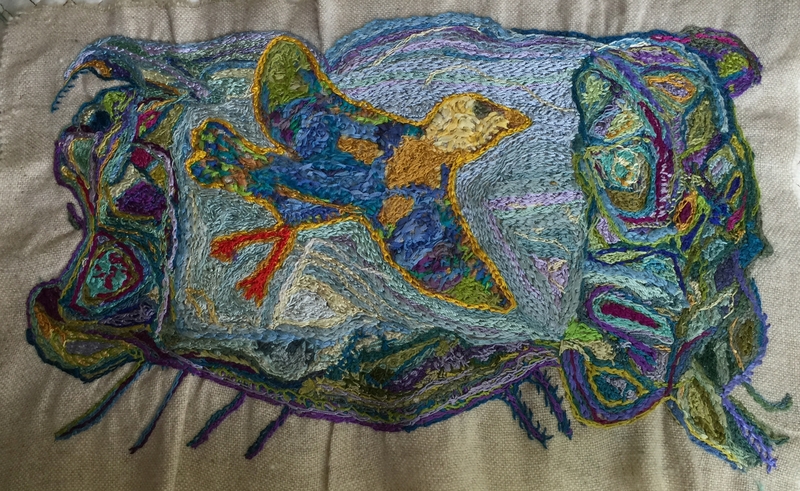 I used silk, wool, and linen in the piece. Every night I would sit and do a little. Each stitch was a word on paper that I could not write. I finished it the first week of August 2015. A feeling of joy, peace, happiness. And a desire to continue to express myself with needle and thread, instead of pen and ink.